The SPF is lower than the over-the-counter product, so re-apply often. 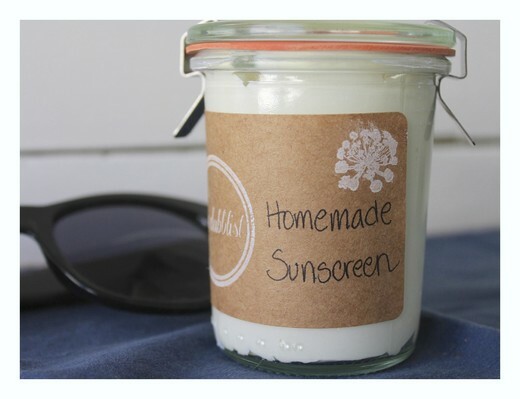 Homemade sunscreen can last for around 6 months and should be refrigerated. Apply generously to skin and reapply every few hours while outside during periods of sun exposure. ● Aloe Vera: The gel from this cactus plant can be used generously on your skin to reduce redness and scaling caused by psoriasis. Aloe vera can be found in almost any grocery or health store. ● Tea Tree Oil: Tea tree oil is thought to have antiseptic properties. It can sooth irritated skin or scalp and can be applied daily. ● Turmeric: Turmeric has strong anti-inflammatory and antioxidant properties. Because of this, turmeric has been found to reduce psoriasis and psoriatic arthritis flares. Turmeric can be found in pill form as well as powder form to be added to food. ● Dead Sea Salts: Soaking in a bath with Dead Sea salts or Epsom salts can remove scaly skin and reduce itching. It is recommended that you use warm water and stay in the tub for 15 minutes. Not only is exercise important to maintain overall health and wellness, it is especially beneficial for people with psoriasis. Because people with psoriasis have an increased risk of heart disease and type 2 diabetes, regular exercise can prove very helpful. Many find it hard to exercise because of the chronic pain associated with psoriasis. Exercise programs in the water prove to be an effective alternative that is easier on the body and still allows you to build endurance and strength. Other simple ways to fit more exercise into your day include short walks, taking the stairs and stretching. ● Soak a towel in cold milk and apply to affected area to relieve itching. ● Add ½ cup ground oatmeal into a warm bath. ● Rub the affected area with the inner side of a banana peel. ● Apply aloe vera gel to affected area. ● Cut several fresh willow branches into 3-inch stems and place in a pot with plenty of water. Bring to a boil, then simmer until water becomes black. Wash affected areas with the water three times daily. ● Slice 15 water chestnuts and soak in 3 oz. of rice vinegar crush and store in a sealed jar. Apply the paste to affected area and cover with gauze. Change daily. Now is the time of year when the sun becomes irresistible. 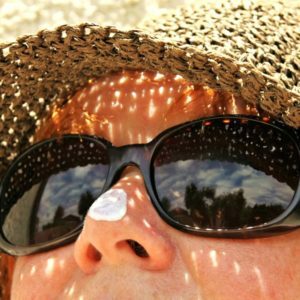 As tempting as it is to spend as much time as possible in the warmth of the sun, there are a few precautions to take to protect your skin from harmful rays. Our skin is the largest organ in the body. It reflects our health and age. Today, there’s much concern about sunbathing leading to an increase in skin damage and skin cancer. Excessive exposure to ultraviolet rays can increase the production of free radicals that can adversely affect the integrity of collagen in the skin. Over time, our skin becomes wrinkled, cracked, aged, and brittle. For smokers, the effects are multiplied. Research suggests that skin cancer is cumulative over a lifetime. It begins with overexposure and serious sunburns during childhood. We can’t live without the sun. Our bodies require sunlight in order to manufacture Vitamin D needed for calcium absorption, among other things. So, we shouldn’t hide from our shining star. Here are a few helpful tips and precautions to take when you’re soaking in the sun this summer. Use sunscreen – Choose a sunscreen with a high SPF number for greater protection. Apply it onto your skin 15 minutes before you go outside. Don’t forget your nose, ears, and neck. 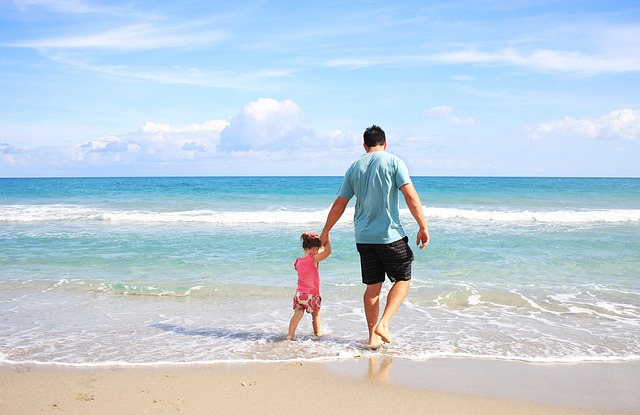 Time is key – Avoid sun exposure when the sun is at its highest peak in the sky, typically from about 11:00 am – 4:00 pm. Gear up – Wear a hat with a wide brim, t-shirt, and sunglasses that filter ultraviolet rays. Drink up – By keeping your body hydrated you can avoid dehydration and provide moisture for the skin to prevent dryness, cracking, and aging. Pop a pill – Vitamins such as A, E, and some antioxidants help prevent skin damage from the inside. Cod Liver oil and Flaxseed oil have also been used to support skin health. Brush it off – Before you take a shower, use a dry skin brush. This can open pores and slough off dead skin, allowing your skin to breathe easily and work more efficiently. Keep healthy – Some medications we take may have reactions and side effects when we’re exposed to sunlight. Acupuncture may be able to provide an alternative to these medications, keeping you healthy, safely and naturally. If you want to enjoy the sun this summer season and not worry later, practice good sun sense. You and your skin deserve it! The small intestine is part of the gastrointestinal tract. Up to 90 percent of the digestion and absorption of food occurs in the small intestine and its main function is the absorption of minerals and nutrients from the food we ingest. It is comprised of three separate parts, the duodenum, the jejunum and the ileum. The small intestine measures upwards of six to seven meters long and it has a surface area of over 200 meters. But in the Traditional Chinese Medical system, the small intestine is much more than just its physical traits. TCM pairs energetic meridians so that they form a complete circuit. There is always a yang meridian and a yin meridian. The small intestine meridian is paired with the heart meridian. Imbalances in the small intestine meridian can lead to problems such as abdominal pain, digestion issues and also appetite problems like overeating or poor appetite. 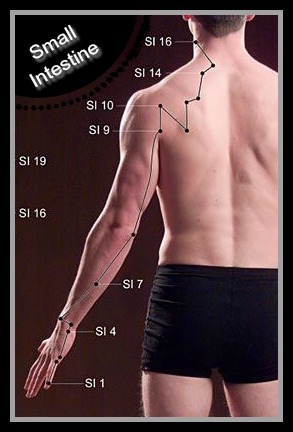 The small intestine meridian starts at the outer tip of the pinky finger and runs up the arm, over the scapula of the shoulder, up the neck and ends in front of the ear. The meridian pathway allows for it to be useful in treating not just intestinal and abdominal issues, but also things like earaches, TMJ, shoulder pain and neck pain. The small intestine is the controller of the reception, transformation and separation of solids and fluids. It receives food and fluids from the stomach and then transforms them by separating the pure from the impure. The pure essence is dispersed throughout the body and the impurities are flushed into the large intestine for eventual removal from the body. Since the small intestine is paired with the heart, it should be noted both meridians belong to the movement of fire. The heart meridian expresses movement upwards, while the small intestine meridian expresses movement downwards. And when considering this pairing logically, it makes sense. When we are experiencing heartache or stress (associated with the heart meridian), most of us then have an upset gastrointestinal tract, pain in the abdomen, vomiting, nausea or even a lack of appetite. The small intestine meridian is particularly sensitive to cold. Therefore eating lots of cold, raw foods can actually lead to problems in the small intestine. When excess cold invades the small intestine, there may be pain around the navel, watery diarrhea or loose stools, frequent clear urination and loud gurgling sounds in the abdomen. In TCM, the small intestine plays both a physical and a mental role. The mental role of the small intestine is to separate the clear thoughts from the turbid ones. This is another way the small intestine is connected to the heart in TCM. The heart houses the mind and is in charge of all of our mental health. Clear judgement depends on the ability of the small intestine to separate the pure from the impure. When there is dysfunction in the small intestine, then there may also be dysfunction in the mind. While the small intestine may not seem as important as the heart or the kidneys, it is still an integral part of our body and as such, it should be taken care of equally as well. If you experience any abdominal or emotional issues, turning to a licensed acupuncturist may be a good start. But most of all, take good care of your gastrointestinal health and your body will respond favorably. The intestines are an extremely important organ and they should never be overlooked. You should make sure to feed your intestines with food that will increase intestinal absorption, by doing so you will help out your whole body. Foods that increase intestinal absorption range from fermented foods to pre-biotic containing foods. Let’s start with the fermented foods. Fermented foods such as kimchi, sauerkraut and pickles can work together to help keep that gut balanced. If you are in-taking foods such as these you are guaranteed to see an increase in intestinal absorption. The bacteria in fermented foods work together with your gut to help break down foods. Pre-biotic foods are also important to the digestive tract. Keep your intestines happy by making sure to load up on pre-biotic foods such as seeds, flax, oats and potatoes. All of these foods encourage the growth of necessary and healthy microbes within your digestive tract. In a study conducted and published by the National Center for Biotechnology Information and in conjunction with the National Institute for Health, patients suffering from lung cancer showed improvements in several areas after being treated with acupuncture. Pain was decreased, appetite increased, nausea and nervousness decreased, and overall, the patients well-being was improved. The study showed that 61 percent of patients reported less pain and 33 percent of the patients reported an increase in their total well-being. Those participants who received more acupuncture treatments reported that their well-being was positively affected and it was determined that a minimum of six acupuncture treatments were required for a 70 percent chance of clinical improvements regarding the overall well-being. 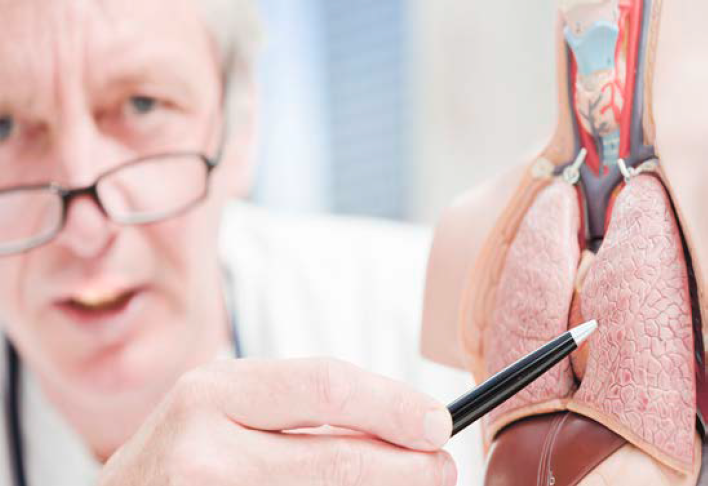 Lung cancer is the leading form of cancer in the United States, according to the American Lung Association. As with most forms of cancer, lung cancer is non-discriminatory in nature and can affect anybody, at any age. However, it is more prevalent in smokers, those exposed to secondhand smoke and people who have asbestos poisoning. Most lung cancer patients have multiple symptoms, including pain, fatigue, depression, difficulty breathing and anxiety. Acupuncture and Traditional Chinese Medicine can be very useful tools in treating the symptoms of lung cancer, as well as decreasing the side effects of radiation and chemotherapy. When the body is balanced, the immune system attacks and destroys renegade cancer cells before they can become malignant. But an unbalanced immune system, will often fail to defend the body from the cancer cells. TCM and specifically, acupuncture, has shown great promise in helping lung cancer patients deal with the many symptoms they encounter. One of the most important ways regular acupuncture treatments can help lung cancer patients, is by boosting the immune system. The acupuncture needles are homeopathic in nature, but when they puncture the skin, the needles are perceived as an enemy by the body. This causes the body to send an immune-mediated response to the area, which in effect, retrains the body’s immune system to attack the intruders. The needles can be placed near or around the area of the cancerous tumor, which allows the defensive action of the immune system to be channeled to the cancer site itself. Acupuncture can also be very effective at treating the other common symptoms of lung cancer. Symptoms like fatigue, depression and anxiety, can be managed with multiple acupuncture treatments that balance hormones in the body. When these are decreased, the immune system and the overall body will become stronger. As with any form of cancer, having the proper diagnosis and treatments are essential. But adding complementary therapies, such as acupuncture, can increase the probability of success at defeating the disease.